The Pugapoo is not a purebred dog. It is a cross between the Pug and the Poodle. The best way to determine the temperament of a mixed breed is to look up all breeds in the cross and know you can get any combination of any of the characteristics found in either breed. Not all of these designer hybrid dogs being bred are 50% purebred to 50% purebred. It is very common for breeders to breed multi-generation crosses. 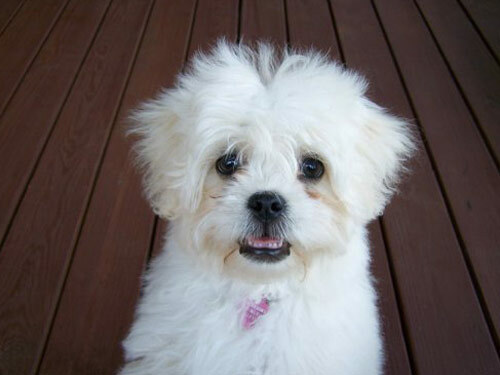 As with many of the Poodle cross dog types, the Pugapoo, also known as the Pugoodle, may be a non-shedding hypoallergenic hybrid dog. They are a cross between a Pug and a Miniature Poodle and are a smaller dog, usually weighing 10-15 pounds at maturity. They may more closely resemble the Pug or the Poodle in both temperament and physical appearance or they may be a true combination of both. The Pugoodle is a sturdy and rather stout little dog, very athletic and up for a run or a game at a seconds notice. They have moderately long legs that are set to the sides of the body, a wide chest and a well-sprung rib cage. The back is straight and the tail is usually curled up over the back. The neck is shorter and the head is well balanced for the size of the dog. The ears typically are larger and longer than on a Pug and the eyes are less prominent but still dark, alert and very expressive. Muzzles can range in length from very short to moderately long, with or without a beard. The coat may be long and curly like a Poodle or very short and straight like a Pug. Some members of this canine hybrid breed may have a combination coat that is straight and shorter on the body and longer and curly on the legs, ruff and tail. Colors can range from tan with black markings through to white, creams, yellows, grays, apricots, blacks, chocolate or even parti-colors with or without white markings. The Poodle hybrid breeds all seem to share the natural tendency to get along well with kids, people, dogs and animals and the Pugoodle is no different. These dogs are very loving and friendly, but they will bark when strangers approach. With proper socialization and training these smaller dogs make great traveling companions and are also excellent pets for families or senior citizens. The Pug-A-Poo is known for its expressive face and its ability to seem to connect with the owner's emotions. They are highly affectionate dogs that need to be around their families as much as possible. This is not a dog that is going be happy sitting outside or living in a kennel, they need to be in the house with the family. While they are active in the house they are not hyperactive and are not prone to being destructive or engaging in problematic behaviors once trained. Very easy to housetrain these little dogs are a good choice for a first time dog owner.